Barring the realization that my voice is judged awful and offensive, I will be singing the the Exultet at this year's Easter Vigil. The text of this ancient hymn runs to nearly six pages and, depending on the singer's pacing, runs between ten and eleven minutes. It's my custom to preach no longer than eight minutes and, generally, I err on the side of four or five. Having to sing twice as long as I'm accustomed to speaking...this will be something! Some people give up chocolate, or alcohol, or meat for Lent. Others commit themselves to more time spent in prayer. My Lenten journey will be recorded in and through the text of an intimidating song. I thought, then, that it might be fitting to break the text up into small sections and offer a few words of reflection upon it. Note how the distance between heaven and earth, the celestial and the terrestrial, is traversed in three verses. The people, bearing candles lit with the Easter flame, are the source of the low light filling the Church. The Body itself is the source of light. In a world bathed in florescent overhead lighting, we too easily take for granted the symbolism of candlelight. Instead of radiating down upon us, Easter's light arises from the congregation and radiates. Each small candle contributes to the warm light heralding the King's triumph over death. This symbolism, I fear, is too easily lost by many Christians. Very often do Catholics, especially, get so focused on the Church as an institution rather than as an event or process unfolding over time. We get so caught up on hierarchies that we neglect that the Church is made up of those who are called to bear to the world the light of the Good News. If we took to heart the symbolism of the whole assembly, bearing lit candles, each offering a ray of light to celebrate the Risen One...how would this affect our understanding of the Church and of what it means to be the Body of Christ? If we really were mindful that each one of us is responsible for carrying the light of Christ to the world, would we so judgmental of others when we know how hard it is for us to keep our own flame's burning? No single candle - certainly not my - candle, can illumine an entire Church. It takes all of us, gathered together, to dispel the darkness. 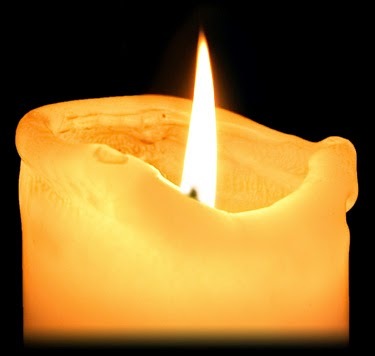 When one candle goes out, others are there to re-ignite it. We err grievously when we mistake our feeble flickering for unassailable incandescence. We are all of us stewards of the light, tenders of a flame not of our origin but whose light and warmth gathers us into one Body, one Church, and unites our voices in praise.